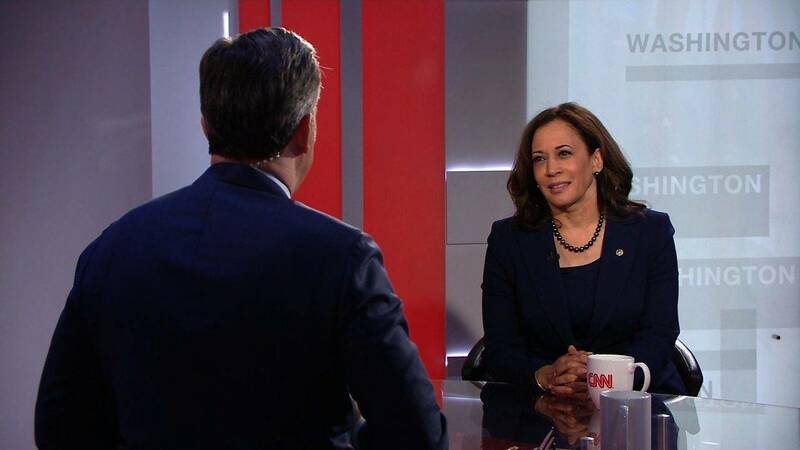 (CNN) - California Sen. Kamala Harris called the shutdown of the federal government a "crisis of the President's own making" in an interview with CNN's Jake Tapper on Wednesday. Harris said she would make a decision soon and she believes the country is ready for a woman of color as president. But she argued that the American people deserve better leadership than they are seeing under this President, stating that the shutdown has thrown lives into chaos. "It is a false choice to suggest that we're going to hold 800,000 federal workers and all of the services that they provide hostage for this president's vanity project," Harris said on "The Lead with Jake Tapper." Later Wednesday night, Harris turned up the heat on Trump by blasting his insistence on holding out for funding for his border wall before reopening the government -- comparing the President's behavior to how her 11-year-old godson might have behaved with his toy train. "Any good parenting would tell you that you don't listen to those kinds of tantrums, and you don't reward that behavior," she said during her first formal event for her new memoir, which was held at Washington's George Washington University. Harris argued that Democrats should not cave to those sorts of tactics. "We've had enough of these powerful voices that are trying to sow hate and division among us," Harris said. "I'm done with that. I'm really done with it. Because it is not only wrong from a moral perspective, it is unproductive if we actually want to be on a trajectory that is about achieving success and progress. It is morally wrong." Answering questions before a receptive crowd in sold-out Lisner Auditorium, Harris went on to chide Trump for inserting race into his prime-time speech about the shutdown on Tuesday. "Did you watch his speech last night?" Harris said. "It was blatant. It was blatant. Talking about African-Americans and Latinos, don't want this stuff happening," Harris added, mocking Trump's tone to laughter from the audience. "What was that supposed to be about? Tell me that -- if not inserting race in a way that was intended to create fear and division." "That's not what a leader does and that's certainly not what the leader of the United States is supposed to do," she said. In her memoir, Harris wrote about how her mother taught her to trust her gut instincts. On Wednesday night, she was questioned by the event's moderator Jonathan Capehart, a writer for The Washington Post, about how she would compare her instincts to Trump's gut. "I would actually say that assumes facts, not evidence that he has a gut," she said. "When we talk about the immigration debate, I think there is no question that there are powerful forces, including this president, that are attempting to vilify immigrants because they were born in another country," Harris said, "and suggest that they are therefore any different in terms of their fundamental values or beliefs, or priorities." "I think all of us as Americans should all be insulted by that suggestion," the Democratic senator said, "knowing that all of us are just a few generations, if not one generation away from immigrants who arrived in this country with the same hopes and dreams that we each have for our children." The former California attorney general also expressed regret that she was not informed by her staff that her former top aide in that previous office was accused of gender harassment, a lawsuit that the attorney general'soffice settled for nearly $400,000 after she had moved on to the US Senate.